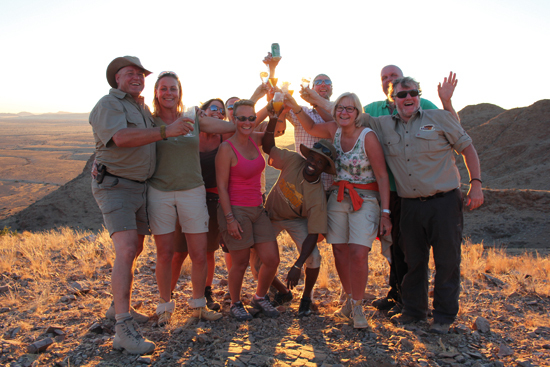 Namibians are in no way strangers to a good braai. The South Africans may have claimed the term “braai” as their own. It is an essential part of their national heritage; they have even replaced their National Heritage Day with National Braai Day. Many believe, however, that it is the Namibians who have perfected the art of turning amazing specimens of meat (such as you can only find within our borders) into culinary delights that make you wonder how it could be in any way possible for anyone to be a vegetarian. In Namibia, where there is smoke, there is a braai. I’ve heard fellow countrymen laugh off the idea of having chicken or fish on a Saturday night, because as we all know, white meat is pretty much a vegetable. The most important aspect that needs to be realised when dissecting the ins and outs of the braai, its mechanics and composition, is that it is in no way dependent on these trivial factors. A true braai finds its essence in the all-encompassing sense of community that a group of like-minded individuals find when gathered around a smouldering fire. It is perfected while drinking beer or wine or coke, chatting about life and love and what the referee did wrong this time. That jovial spirit seeps much deeper into the meat than the salt, Worcestershire sauce or Jimmy’s ever will. The braai isn’t a primal way of cooking meat for survival purposes. It’s an institution that we as southern Africans have built our culture around. It is the chops on the grill in someone’s backyard, the kapana* being enjoyed by a group of friends watching the Brave Warriors and the boerewors roll eaten around the campfire under an unbelievable Namibian night sky. It came as a culture shock when I received a very strange invitation to dinner at Moon Mountain Lodge near Sossusvlei late last year. 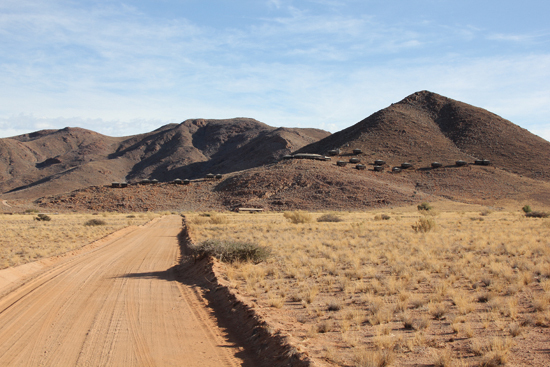 The invitation was gladly received (who says no thanks to a Sossusvlei lodge visit and free food? ), but something about it irked me. The intention behind the invite was to come and experience a celebrity chef from the Netherlands…braaiing. I will admit that I reread the email quite a few times. When I read the words “celebrity chef from the Netherlands” the foodie within me sat up straighter, but then followed the words “BushKitchen” and “braai”. Now, I’ve never been to the Netherlands, but I thought I knew enough about Dutch culture to be able to logically exclude the word “braai” from their vocabulary, not to mention their menus. Nonetheless I was there on the prescribed day, ready and willing to see what it was that these Dutchmen were going to attempt to teach us Namibians about our own culture. Low and behold – the surprise of a lifetime. What I found was a group of friends and avid travellers who had explored various African destinations and were not first-time visitors to Namibia. Among them was the man I had come to meet, Harm-Jan Bloem, the Braai Master. Known in the Netherlands as “The BBQ Man”, Harm-Jan is a popular celebrity chef. He has been on a cooking show on Dutch television, catered to private functions, music festivals and even VIP lounges attended by rock stars. He is also one of the main judges at the annual Jack Daniel’s World Championship Invitational Barbecue held at the Jack Daniel’s Distillery. Harm-Jan’s passion lies in his BushKitchen adventures, though. 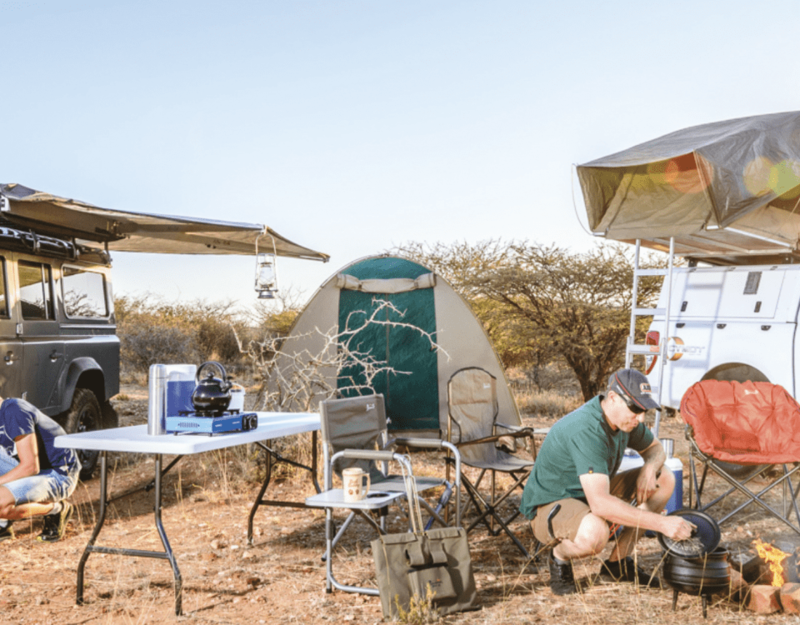 He has braaied in various African countries, in national parks with game rangers as his dinner guests, and has even joined Marlice and Rudie van Vuuren for a braai alongside the cheetahs at N/a’an ku sê. Among the group accompanying Harm-Jan on his most recent trip through Namibia was a lifelong friend, Marcello Pacenti. Raised in South Africa, Marcello was the one who first introduced Harm-Jan to the braai culture, and he hasn’t missed a bite since. The two-day visit went by in a blur of eager chatter, sundowner drives and the keen excitement that always accompanies making new friends. I found that these were key ingredients for a great braai long before the meat went on the fire. When it came to the actual event, the Big Braai, Harm-Jan was welcomed into the lodge’s tented kitchen area by resident chef Alexa Wiehahn. Alexa had already spent most of the day preparing extra dishes for the night’s dinner, which would be attended by the other guests staying at the lodge as well. 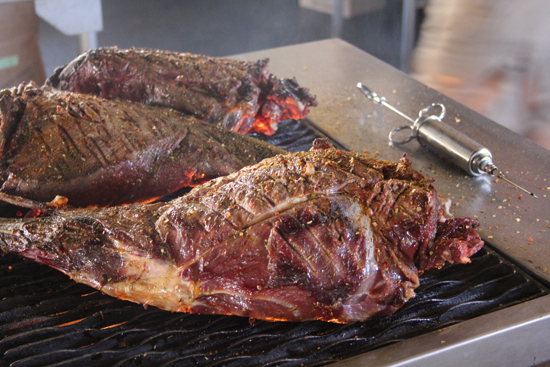 Harm-Jan’s task was to braai and Alexa and her team created side dishes to round off his main menu item, a springbok leg. After all, as Marcello pointed out: “Harm-Jan is the meat man, not the vegetable man”. The kitchen exploded into something akin to an episode of MasterChef Australia and I diligently snapped away with the camera as he threw together stock (known as bouillon), spiced the meat and precooked it slightly. The stock was then injected straight into the meat using an enormous silver syringe straight out of a Hitchcock film. The most exciting part was the flame-grilling finale. Harm-Jan is sponsored by Jack Daniel’s and as such uses the whiskey in all his cooking. A bottle of Jack Daniel’s, complete with a spraying cap, was his very original version of a “secret sauce” and made the flames jump around the “springbokkie’s” leg excitedly. 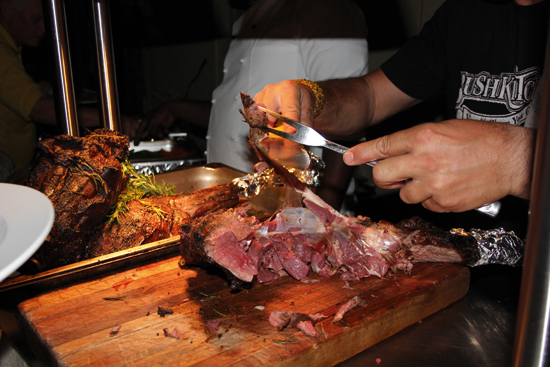 Harm-Jan made his obligatory speech as he presented his friends and family, as well as the rest of the lodge’s guests, with the final product, a perfectly medium-rare springbok leg. The first taste was a wake-up call. 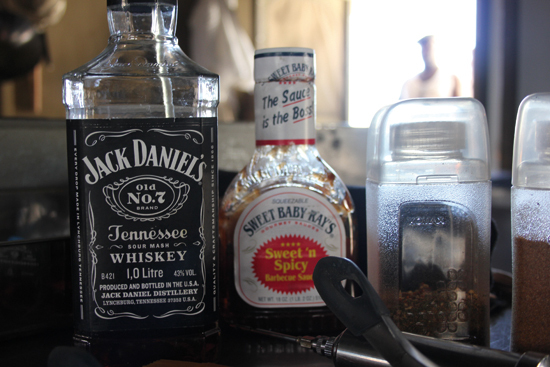 The Jack Daniel’s gives the meat the most surprising and amazing salty-sweet caramelized taste. I had never tasted anything like it and every bite was an adventure. Alexa’s accompanying sides and her mouthwatering goat (boerbokkie) pie rounded the evening’s menu off to something that not even Gordon Ramsey could find fault with. ENJOY HARM-JAN’S SPRINGBOKKIE FOR YOURSELF! vegetable seasoning, garlic and soy sauce. Spread the marinade over the leg with a brush. Insert a notch in the soft flesh every 10 cm with a knife and put a clove of garlic into each indentation. Lay the leg on the braai directly over the fire (this sears the meat nicely), and turn the leg regularly. Inject the leg with the stock every 4 cm and spray the leg every 10 minutes with Jack Daniels. This will caramelize the meat and give it a nice brown colour. This can also be done with apple juice. 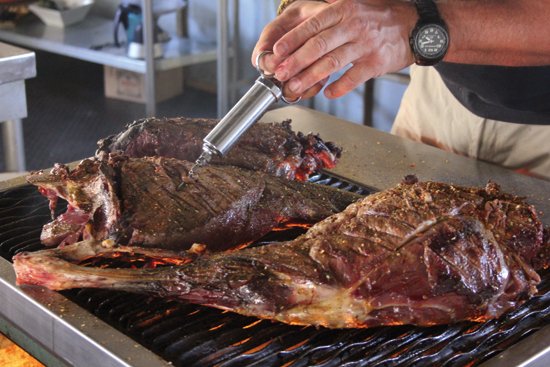 Grill the leg for 30 minutes on the barbecue, depending on the size of the leg. There should be a crust and the meat must not yarn. remainder of the stock over the leg. Put fresh rosemary sprigs on the leg and into the stock. depending on the thickness of the leg, for one hour to one and a half hour in the oven and let the leg yarn until the core temperature of the springbokkie is 50 °C (medium-rare). Remove the leg and let it rest until the meat is tackled. 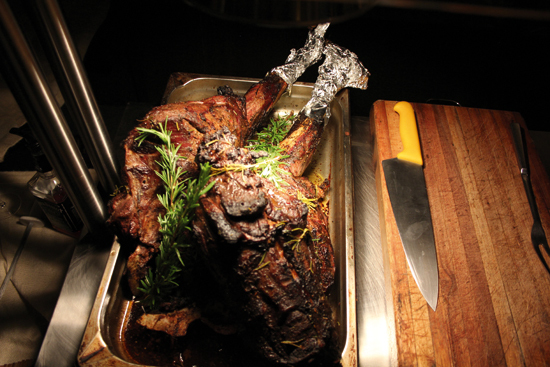 Serve the leg with the stock from the oven, fresh rosemary and salt to taste. To book your stay at the spectacular Moon Mountain Lodge visit www.staytoday.com.na for amazing deals and getaway packages. 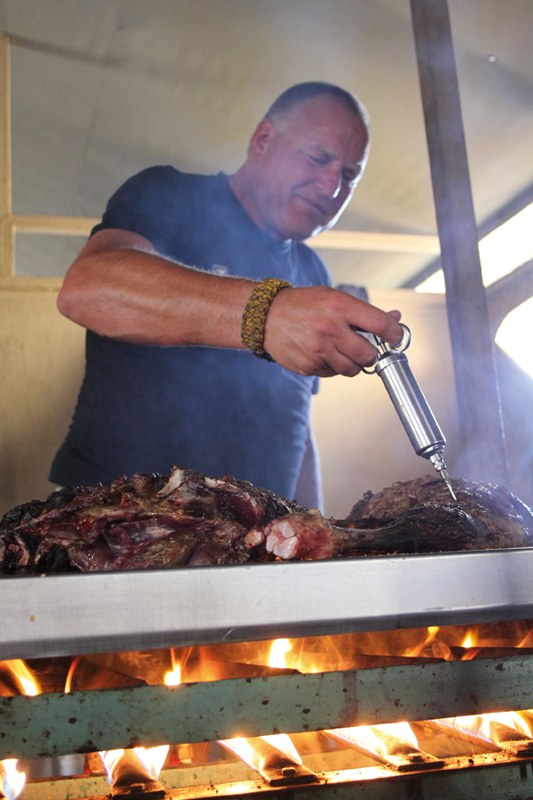 You can see some of Harm-Jan’s most spectacular braai destinations on his website (www.bushkitchen.nl), Facebook page or YouTube channel (Google translate will assist with the language barrier). This article was first published in the Autumn 2015 issue of Travel News Namibia. Thank you to our partner in travel, Abenteuer Afrika Safaris, for affording Moon Mountain Lodge this wonderful opportunity. Riana Murray from Abenteuer worked extremely hard to make this tour an unforgettable experience. 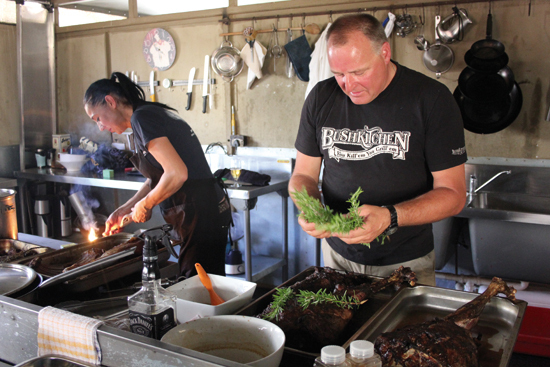 It is also Riana who selected Moon Mountain Lodge as the preferred property to host the Bushkitchen event. Moon Mountain lodge is extremely grateful. LOVE IT THANK YOU TO ALL. THIS WAS TRULEY A WONDERFULL EXPERIANCE.